Huxtable farm is set within 80 acres of rolling countryside and woodland. 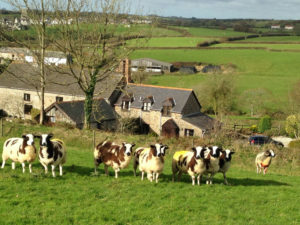 It offers panoramic views, quality en-suite B&B farmhouse accommodation, a Devon Wildlife farm trail and is home to a flock of Jacob sheep which were originally purchased from the, near by, National Trust property Arlington Court in 1993. The Jacob Sheep is an ancient breed of horned sheep. It is a dual purpose sheep, providing tasty sweet meat and high quality wool. 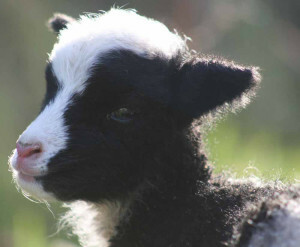 These unusual black and white sheep are also popular for their unique appearance. As a spinner & knitter my interest was originally in the fleeces because their wool is soft and with the brown and white patches offers a variety of natural shades from light cream, grey to dark brown. Not only do they produce excellent wool, they usually lamb twins trouble-free and provide superb, lean, flavoursome meat, due to the sheep grazing more than grass i.e. nibbling leaves from trees, brambles etc. Lambing will commence around April Fools Day, as the ram joined his ewes on the 1st November. (The ewes are pregnant for 21wks). 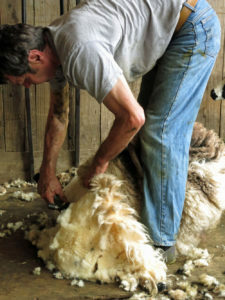 Shearing usually takes place during June. The colours in their fleeces are sorted into light and dark, whilst the lambs fleeces are left as they are to create the grey wool, producing a variety of natural, un-dyed colours. Sold to The Natural Fibre Company to be mixed with Mohair to produce cloth for a well-known British clothing company. a. Washed and carded into washed & carded fleece and sold to spinners and felters. b. Washed, carded and spun into double knitting yarn. c. Spun into yarn ready to be sent to Curlew weavers in Ceredigion, Wales, to be woven into beautifully soft cloth to produce scarves, shawls, knee rugs, cushions and throws. All to make beautiful Jacob sheep products available to purchase. Prolific – 190% born alive is a realistic lambing percentage. 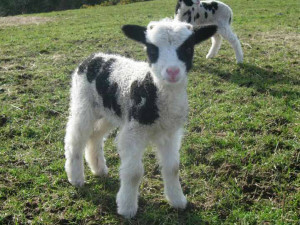 High lambing percentages are to be expected, particularly to ewes lambing later in the season. 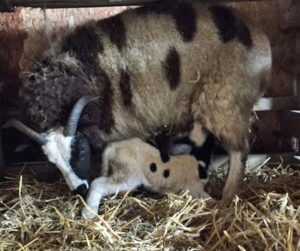 Easy lambing – The breed is noted for its easy lambing attributes, which is ideal for novice or first-time sheep keepers or for those whose time is limited. This is also a benefit where saving labour on the farm is desirable. Good Mothering Qualities – Jacob ewes show consistently good mothering qualities and many will successfully produce sufficient milk to rear triplets without resorting to supplementary feeding. Hardy & Long-lived – Easily over wintered outside and attracting few disease problems. Jacob sheep also attract less foot problems than many breeds. Having good feet and high heath status allows Jacob sheep to keep breeding for many years. 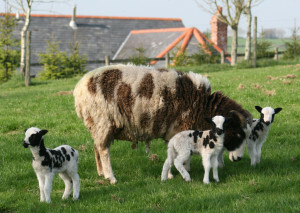 Ewes rearing lambs for 7 years or more are not uncommon. Carcass Quality and Flavour – Ideally suited for deep freeze or farm-gate sales. The exceptionally full flavour and leanness is retained even in hogget carcasses. Customers supplied direct always come back for more, preferring Jacob lamb to product sourced from regular outlets, often being prepared to pay a premium price for this quality. When crossed with any of the popular terminal sire breeds, the Jacob ewe produces fast-growing lambs capable of meeting the exacting standards of today’s retail trade buyers. Wool and skin – They also produce high quality wool which is excellent for spinning and weaving. The unique colour of the wool makes every garment or woven item individual. The tanned sheepskins make very desirable rugs and the skins can also be used to make a variety of other goods. The origin of Jacob sheep is not known with any certainty. One belief is that they came originally from Mesopotamia (Iraq, northeastern Syria, southeastern Turkey and southwestern Iran) as they are closely related to the fat-tailed sheep of the Middle East. The first flocks in this country were imported from the former Cape Colony, the breed having been established by settlers from Spain and Portugal. the coast of North Africa and Morocco. In the 17th and 18th Century, Jacob Sheep were imported from Spain by the British landed gentry. The oldest known flocks which were imported in the 1750s still graze at Charlecote Park in Warwickshire. The Jacob breed with its splendid horns and distinct spotted fleeces made it an ideal ornamental sheep to graze with deer in parklands surrounding castles and stately homes. By the end of the First World War, many of these flocks had disappeared and by the mid part of the century there were very few Jacob sheep. A small number of dedicated breeders and enthusiasts were determined to preserve the breed, and in 1969 the Jacob Sheep Society was formed with 96 members and 2,700 registered sheep.